Your serene villa on the lovely Hilton Head Island offers the best of both worlds. It is located in a prime un-commercialized South Forest Beach location just 2 blocks from the beautiful tropical beach on the Atlantic. Your villa is in an excellent location for beach enthusiast, golf fanatics, tennis buffs and restaurant aficionados. Your vacation villa is perfect for couples or families with kids to enjoy! Hilton Head Island offers a wonderful tropical climate with one of the best beaches on the Atlantic. The Island also offers plenty of other activities including biking, fishing, scuba diving, snorkeling, and many other water sports. The island is also home to more than 200 distinctive restaurants for your dining pleasure. Just had Bathrooms totally remodeled with top of the line tile, cabinents, countertop and all features. Your 2BR/2.5 bath unit is one of the larger villas within the area's complexes. The roomy main floor plan includes the kitchen, dining, living area, half bath and walk out balcony. As you walk out on your deck you will encounter the view of the pool and turtle lagoon through the living area entry. From your deck you stroll to the picturesque pool (perfect for tanning), overlooking the tropical lagoon. There are two spacious bedrooms located upstairs, each with its own sizeable bathroom. The main bedroom overlooks the tranquil lagoon and pool area. Your villa includes one hour free tennis court use per day from the world famous Van Der Meer Professional Tennis Complex, located right next to the villa. There are more than ten public golf courses located within a ten minute drive of your villa. 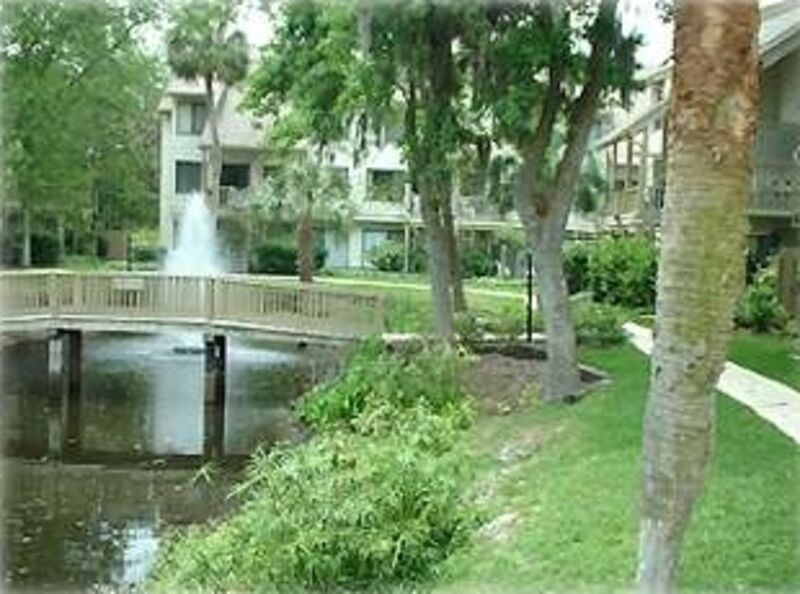 Also located within walking distance is the popular Coligny Circle. It affords many conveniences including numerous restaurants, shops, and other activities. You are also within a brief drive from Harbour Town and Shelter Cove Harbour which offers more unique shopping and fine/casual dining. If you are interested in skiing please also see our Keystone Colorado condo at listing 5175. 1 Free Hour per day. Really charming place with an awesome pool and close to the beach. Loved staying here. It was spacious and perfect for us. We had one issue with a broken door lock and Kevin got it fixed for us ASAP. Lovely place. The Villa was very spacious for our family of four.The open concept floor plan on the lower level was very inviting and cozy. It was stocked with cooking supplies and had a washer and dryer tucked neatly into a corner as well. The space was very clean and set up nicely. The upstairs was again very spacious having full bathrooms connected to both bedrooms, one room had two twin beds and ours had a huge King bed which made.for great sleeping! Both bedrooms had plenty of storage and the bathrooms were stocked with towels. Access to everything in the Coligny area was a short bike ride away. We enjoyed our recent stay at this Courtside condo. The owner was very responsive before and during our stay. The unit had plenty of space both in the living area and the bedrooms. We enjoyed the games and puzzles that were in the living area. The only thing I would note (I'm not sure if this is in the description or not) is that this is a second floor unit and there are steps to get to the bedrooms inside the villa. Very close to the beach! Great location and relaxing stay! very clean and well kept unit. Quiet block even though we were just a block from beach. Great unit clean,new laminent flooring,quiet,easy access to pool ,beach, everything worked fine in unit. Short walk to shop or eat. Would stay here again for sure.